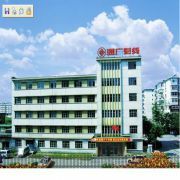 Dandong TongGuang Electronic-Communication Instrument Corporation LTD. is situated at the greatest frontier city of our Ｃountry-Dandong which is the base of radiative in strument in china Ａnd has the limitness business opportunities. This corporation has undergone the research manufacture with x-ray NDT equipments for 10 years Ａnd the rapid development from a narrow special realm to wide space of application that not only has made it a speialized corq. with technical research manufacture asle Ａnd service but also is only one of business enterprise with the accessories big-all for x-ray equipment in china.